Pearls are popular jewelry stones. Learn about their properties and varieties, as well as practical tips for repairing and working with them. Aesthetic interpretations are as unique as fingerprints. Give three people the same trendy sweater and each will wear it in a different way. Give three jewelry designers the same unusual cultured pearl and each will design a distinctly different piece. Such was the challenge MJSA Journal posed to three innovative talents in the jewelry industry: Katey Brunini of Solana Beach, California; Ernesto Moreira of Houston; and Alishan Halebian (best known as only Alishan) of Irvine, California. These 950 Palladium earrings were designed by Tom McLaughlin of Lennons Jewelers, Syracuse, NY. The top portion of the design is bead set with small round brilliant diamonds on one side. When worn, the bottom portion swivels and is bead set with small round brilliant diamonds on both sides. The two sides of the bottom portion are separated by 18-karat yellow gold spacers. The diamonds on each side of the bottom portion accent the round Tahitian cultured pearls as they swivel when worn. When buying cultured pearls, consumers must consider several quality characteristics that are very different from the four C’s of diamonds or gemstones. Nacre quality is very important. The nacre is the layers of protective coating – a pearly substance – that grows around a pearl nucleus. Experts warn that only pearls with a sufficient layer of nacre will last through years of wear; thin-nacre pearls often peel or crack. A nacre that is less than 0.35 mm is considered too thin, and thicker is always better. When Chinese freshwater pearls began flooding the market several years ago, craft artists took notice. It is not that pearls were new to them. Studio jewelers had been incorporating pearls into their designs for decades, long before the current wave of Chinese freshwater pearls reached these shores. But the growing availability of Chinese freshwater pearls has allowed artists to indulge their passion for pearls as they never could before. When the first warnings about color enhancement of golden South Sea pearls came out five years ago, fear struck the South Sea pearl industry. Some of the new enhancement methods for golden pearls were nearly undetectable, leaving dealers and retailers guessing how many pearls on the market were treated and wondering whether golden pearls were going to be the gem world’s next disclosure scandal. Since the beginning of time, man has sought to improve upon nature. Pearls are no exception. The majority of today’s cultured pearls have undergone some form of processing or treatment after their removal from the mollusk. The only way to confidently buy in the wholesale arena is to learn what to look for and what to beware of. Pearls don’t need polishing or faceting to reveal their natural beauty. That’s why pearls were among the first gems worn by humans. The oldest known pearl necklaces graced the necks of women more than 4,000 years ago. Warming waters, changes in weather patterns, and increases in storm activity may all affect the future success of pearl farms, both freshwater and ocean-based. Precisely what impact they will have is a little harder to determine: Relatively little research has been done into oyster husbandry. Thirty years after Robert Wan began culturing his first Tahiti black pearls in the seas of French Polynesia, he is still fascinated by the darkly shimmering treasures. When discussing his successful journey to become one of the most influential suppliers of cultured Tahiti black pearls, he still beams and comments, persuasively, “I love pearls!”. Ginseng, green tea, and herb and oil extracts are just a few of the main ingredients in millions of cosmetics on the market today. And now pearls have entered the picture in a bigger way, hoping to take the cosmetics industry by storm. But the use of pearls in cosmetics is not a new concept. For thousands of years, people in Asia, especially in China and Japan, have been using pearl powder as a natural remedy to maintain the appearance of youthful skin. It has also been used in traditional Chinese medicine as a dietary supplement, usually in capsule form, to supply the body with amino acids and minerals. Both natural and cultured pearls are formed when an irritant lodges in a mollusk. The mollusk then deposits layers of nacre, covering the irritant and producing a pearl. In a natural pearl, the irritant may be organic or inorganic matter. 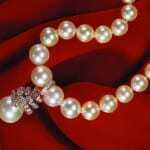 In cultured pearls, the irritant is a mother of pearl bead or a piece of tissue placed in the mollusk by a technician. The mollusk covers the nucleus with alternating layers of conchiolin (a protein-like substance similar to human nails) and nacre. The latter consists of very fine crystals of calcium and aragonite, which are very soft minerals. It is delicate and can be scratched or chipped easily.